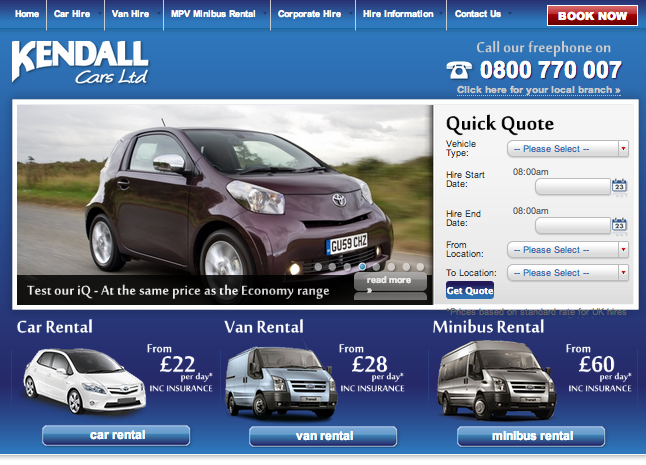 Kendall Car Rental provides very cheap rentals for cars, vans and minibuses. Prices include VAT and car insurance and start from £22 per day for super mini cars such as the Toyota Aygo and Smart ForTwo, £28 for a small van such as the Peugeot Partner van and £49 a day from something as big as a minivan. With good customer reviews across the web, this site is definitely one to check out. With great reviews and simple rules, Kendall Car Rental are a great company to go to for those looking to rent a car or van in the U.K. While it is always best to check with the company themselves during booking, everything else about the company seems easy-to-use, quick and efficient. With the ability to pick the right car and rental length for you, anyone looking to rent a car in the U.K. would do well to start with Kendall Car Rental.